The crisis in Greece has proven it necessary to not only pose important questions of solidarity but also to practice new ways of learning how to live, think, and learn together. The recent European rhetorics of guilt and blame reflect this shortcoming of a common practice: in the end we all do sit in the same boat. Now the first question is not who is rowing the boat, but how do we keep it up and running, how to keep it waterproof in times when tides are getting higher than we are able to deal with. Thus the question is not anymore who are the ones who steer (who is the captain? ), not anymore who are the ones who are said to be ‘parasitic’ (like stowaways), but rather: how to construct such a boat in order to make it through stormy weathers of political and social crisis? We interpret this question not just metaphorically but take it at face value by building a raft together. 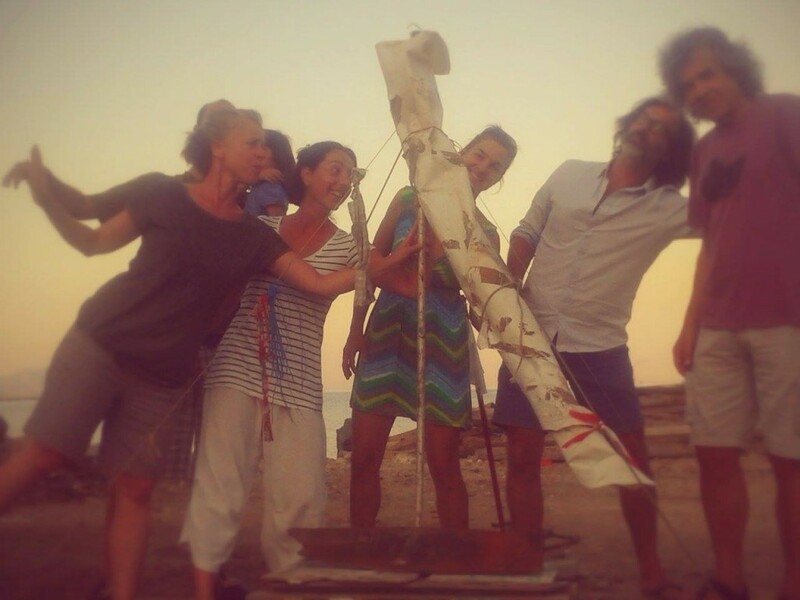 Thus Silke Bake (D), Ash Bulayev (US), Zoi Dimitriou (GR), and Peter Stamer (D/A), being artists from the fields of choreography, performance, and theatre conducted the their research project on creating communality on Syros in August 2015. In a series of meetings, encounters, working sessions both situated in the Akropoditi dance centre and in town, we undertook preliminary steps towards the building of floating structures in 2016. We invited curious, interested local residents, artists, activists, citizens for a get-together on August 5th at Akropoditi Dance Centre to exchange thoughts, ideas, motives. Finding out how things go, leaving routines behind, circumnavigating given knowledge, conquering new ways of appropriation and sharing was part and parcel of our adventure – and it’s that kind of curiosity we asked people to come with to our communal dinner we invited for on the terrace of the Akropoditi Dance Centre. Further off, we set out on a first trip on August 6th to the Syros harbour to see how we could adapt our initial idea – to build rafts – to the given context. Our work methodology entailed starting with the landscape we were working in, using the material we found, fabricating the tools we were in need of, taking the circumstances into account and thus produced the knowledge, skills, and intelligence we required to work together. Since we were steered by the conviction that sharing practices exercise democracy and agonistic togetherness we wished for this project to take a noteworthy stand on the challenges the economic crisis imposes on contemporary Europe, Greece and its citizens.